Drink drivers from Eastbourne have been banned from the road. Sussex Police has just released details of court cases involving drivers from the town who were convicted as part of the force’s crackdown. A total of 150 motorists were arrested in Sussex as part of the summer crackdown on drink and drug-drivers, which ran from June 1 to July 1. Alex Aquino, 42, a publican, of Hoad Road, Eastbourne, was arrested on the A27 at Polegate on June 26 and charged with driving with 59mcg of alcohol per 100ml of breath in his system. At Hastings Magistrates’ Court on July 12 he was disqualified from driving for 16 months. He was also ordered to pay a £340 fine, £85 costs and a £34 victim surcharge. Marek Ambrozk, 58, a restauranteur, of Barden Road, Eastbourne, was arrested in Willowfield Road, Eastbourne, on June 29 and charged with driving with 145mcg of alcohol per 100ml of breath in his system. At Hastings Magistrates’ Court on July 19, he was disqualified from driving for 30 months. He was also ordered to carry out 100 hours of unpaid work, and pay £85 costs and a £85 victim surcharge. Ronald Gwynne, 41, unemployed, of Selmeston Road, Eastbourne, was arrested near his home address on June 29 and charged with failing to provide a specimen of breath for analysis. At Hastings Magistrates’ Court on July 19, he was disqualified from driving for 36 months. He was also ordered to carry out 60 hours of unpaid work, and pay £85 costs and a £85 victim surcharge. 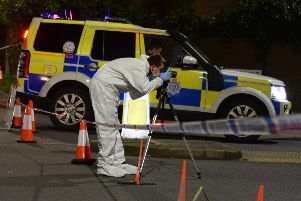 In addition, Bogdan Niwa, 51, a builder, of Granville Road, Eastbourne, was arrested in Beach Road on June 13 on suspicion of drink driving and charged with failing to provide a specimen of breath for analysis. At Hastings Magistrates’ Court on July 12, he was disqualified from driving for 24 months. He was also ordered to pay a £350 fine, £85 costs and a £35 victim surcharge. Further afield, a drink-driver who attempted to swallow his key after being caught more than three times the legal limit has also been convicted. At about 8.30pm on Saturday June 24, police received reports of a white Mercedes Sprinter being driven erratically on the A27 westbound through Arundel. The van continued on the dual carriageway towards Chichester, before it turned into St James Industrial Estate, where it was abandoned. Police say officers located the suspect down an alleyway a short time later, at which point he placed his van key in his mouth and attempted to swallow it. Concerned for his welfare, police restrained the man and made him spit out the key. After failing a roadside breath test, he was then arrested on suspicion of drink-driving. Daniel Sargent, 26, a courier, of East Cosham Road, Portsmouth, Hampshire, was charged with driving with 107mcg of alcohol per 100ml of breath in his system. The legal limit is 35mcg. At Worthing Magistrates’ Court on July 11, he was disqualified from driving for 24 months. He was also ordered to carry out 100 hours of unpaid work, and pay £85 costs and a £85 victim surcharge. A spokesperson at Sussex Police said, “People in Sussex can text officers on 65999 with the details of people they suspect of drink or drug-driving, or visit the Operation Crackdown website.